I don’t know if you have noticed it, but Google’s home page is showing some really cute images. I think they started doing it yesterday or the day before. What are these cute images? 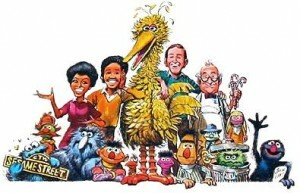 Everyone recognises them – character from Sesame Street! The show crossed the Atlantic 18 months after its US launch, but the BBC rejected it because of its “authoritarian aims” in trying to change children’s behaviour. “This sounds like indoctrination, and a dangerous extension of the use of television,” said the head of children’s programmes at the time, Monica Sims. TV critic Barry Norman, writing in The Times in November 1971, said it was “neither good enough nor bad enough” to justify all the fuss, adding that the BBC had no need for it because it already broadcast Blue Peter and Play School. Indeed, cultural differences may play a big role in the story. With successful children’s shows being shown in the UK, Sesame Street has a lot of competition. We also have to consider the bias that the British have for their cousins across the sea. Still, the show is shown on Five. So today, while Sesame Street continues to be shown in more than a hundred countries, the children of Britain are not particularly affected by the hullaballoo. That does not mean that they are not getting the “telly education” that other children are not getting, though, does it?